"RemoconCon version2.X for Windows95" change into the freeware for some time. It will be shareware again when version for Windows2000 will be completed. The versions of other platforms ( ex. Palm OS or WindowsCE) are continuously being shareware. "PASSWORD" of "RemoconCon version 2.X for Windows95" which unlock demo version is "REMOCCV20". "RemoconCon version2.X for Windows95" requires not virtual IrDA port (com4) but physical IrDA port (com1 or com2). This physical IrDA port was concealed from the OS and was defined Network Device on the Windows98/Me/2000/Xp. But you can get back physical IrDA port (com1 or com2), if you are power user. If you are using the Windows98, it isn't impossible to work by edition of the driver inf file. This method is written in the Japanese web documentations of this Softwares for IrDA Devices homepage. Read Japanese web documentation, and you must not ask me about this method. If you require annoying description about this method written in English by e-mail, I will abort the issue of the password. IR powers of "SONY VAIO C1 Win98 model" and "CASIO FIVA Win98 model" are very strong. They are good PCs for IR remote. There are a lot of users of "IBM-PC110 upgraded to Win95" to work with "RemoconCon for Windows95" in Japan. Edit the driver inf file with your own responsibility. You are lucky, if this software works. 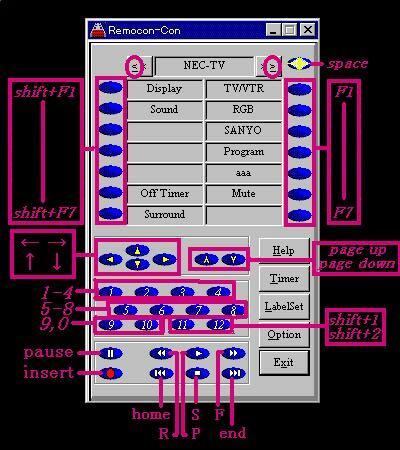 RemoconCon is the first ever Windows95 software ( since 1995 ) that imitates an infrared remote control using the built-in infrared port (IrDA). RemoconCon use the built-in infrared port. By using Fujitsu (Japan) "IR-Commander" or "Crossam2+ ( Japan ) ", you get high reliability computerized home control environment. IR Commander is a multi-function adapter that supported IrDA / ASK / 24 feet 360 degree TV-Remote. Crossam2+ is the remotes which equipped RS-232. I recommend above two devices. Another selection, use Actisys ACT-IR200L. ACT-IR200L has TV-Remote function, It isn't known generally. RemoconCon use this TV-Remote function. RemoconCon play back the procedure you setup. List of computers, those were possible to run. List of electrical appliances., those were possible to control. Added support for ACTIR-200L/SHARP CE-IR5 (CS8130TV-Remote). Added function that load RemoconCon into memory when Windows95 is initializing. Added function that avoid a conflict with the MS-IrDA2.0. Released the first version of RemoconCon. This version was for Hal Corporation (Japan) "Crossam2" and TEAC "RC-20000". The "Crossam2" and the "RC-20000" were the remotes which equipped RS-232.